Although rain plays a big part in keeping your solar panels clean, it does not wash off everything and your panels will become increasingly less efficient as time goes on. 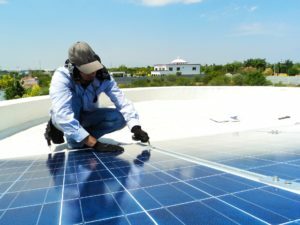 A build-up of dust, pollution, mould, bird or bat droppings, salt, etc are unavoidable and have been tested to reduce solar panel efficiency by 10% – 25%. Attempting to clean your solar panels on your own can be extremely dangerous as any water on the roof will make the area slippery. We also do not advise using a pressure hose as this could easily damage the seals and void the panel warranty. Reliable Solar Power offers a thorough solar panel cleaning service for only $7 per panel, which we recommend every 8 – 12 months to maximise your solar performance and return on investment. 2 solar professionals providing a full clean of each panel and frame. We use a wash that it is pH Neutral, non-corrosive and bio degradable. A hand polish or buff of the glass surface in order to remove any streaks or watermarks. An inspection of the condition of your solar panels, mounting equipment and installation compliance. A calculation of your average daily solar yield, in order to determine if your system is performing above/below minimum expectations (we require the date your system was installed and connected to the grid by energex).